Somehow, even after our trip to Doughnut Plant, Laura and I still had room for more carbs, so we walked our way over to Jim Lahey’s place, Co., for some thin-crust pizza. Although the weather was amazing that day, we opted to stay inside, where it was surprisingly quiet for 1 PM on a Saturday. 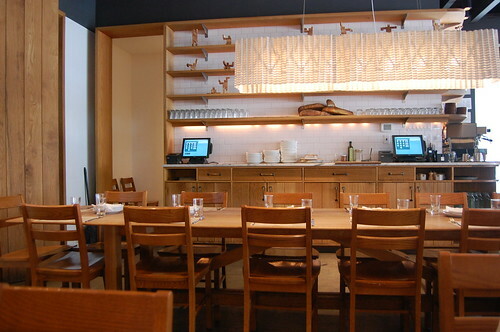 The interior set up and decor was pretty minimalist, with one large table for communal dining going down the midde. To ensure we had a “balanced” meal, we ordered one “Boscaiola” pie, with tomato, mozzarella, pork sausage, mushrooms, onions, and chili flakes, and a green-laden “Popeye,” with Pecorino cheese, gruyere, mozzarella, spinach, black pepper, and garlic. 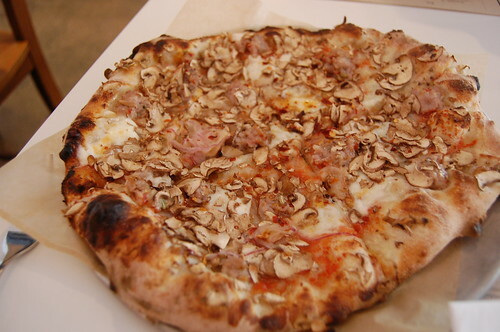 Because I’m a sucker for any pizza with meat and mushrooms, the Boscaiola was my favorite. The sausage tasted very fresh and I liked the not-so-subtle, spicy kick from the generous sprinkling of chili, which was well balanced against the sweetness of the tomato. I was actually surprised by how much I liked the Popeye. 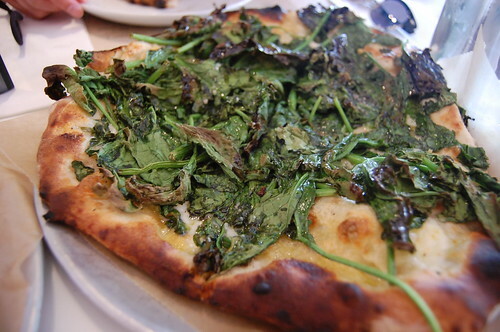 They really don’t hold back with the spinach, and some of the green leaves became wonderfully crisp from cooking at such high heat, almost like garlicky, salty spinach chips. And though I tend to stay away from too much cheese on my pizza, I really loved the combination of the nutty Gruyere and the sharpness of the Pecorino. Because the pizza was so delicious, Laura and I actually managed to finish two whole pies, even though our stomachs were to the point of exploding by the end. Luckily, we had an afternoon of exploring the Chelsea art galleries to work it all off. 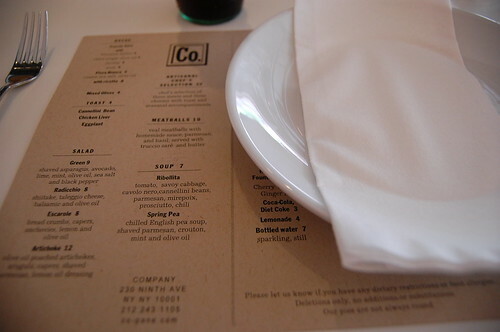 You are currently reading Pizza at Co. at Notes on Food.